The problem with bad breath is that you are usually the last one to know if you have it. But you probably remember, very well and uncomfortably, the times when a co-worker, client or even your boss needed to chat with you and all you could think about was their halitosis. Maybe it was the coffee and doughnuts they ate 3 hours ago. Or the bagel, cream cheese and lox at lunch. Or the super garlicky leftover pizza in the break room fridge. Not the best way to engage in brainstorming, problem solving, deal making and customer service! If you’re trying to get an important point across in a meeting, or trying to convince a client to buy your product or service, you don’t want anything to sully your message. Bad breath will get in there and stomp all over it. Worse still, bad breath causes a bad first impression. If you want to put your best breath forward and cut down on unnecessary and unpleasant distractions, having easy access to mouthwash after your coffee break and lunch can make all the difference. From the moment I started dealing with them LOYAL has lived up to it's name on a daily basis every representative and associate I've ever encountered has been nothing short of amazing. They are punctual, hardworking, friendly and very understanding of other people's schedule.... they will work with you and for you to the best of their abilities and I would most definitely recommend them to anyone who asked for quality service. You don’t need to be a dentist to understand how important it is to keep your mouth clean and fresh. It’s often inconvenient for everyone to bring a toothbrush and toothpaste to work, but mouthwash can help! It kills halitosis-causing bacteria that stinks up your breath and also the sugar-bugs that can bore into your tooth enamel while you’re rifling through spreadsheets and running to the next meeting. Another follow-on health benefit of providing a tamper-free, onsite mouthwash dispenser for your employees is that it can actually improve overall oral health for everyone, which can lower your dental plan costs! But wait, there’s more: People are less likely to mess up their clean, fresh breath (or their waistlines) with doughnuts in the afternoon if they’re enjoying the freshness of a recent mouthwash moment. Again, health plan benefits for everyone in the office—in such a simple, pleasant way. It’s hard to focus on your own presentation or client meeting if you’re worried about that spicy sandwich you had at lunch. It’s really the little things that matter when being confident at work or with a client, and fresh breath goes a long way to making that happen. 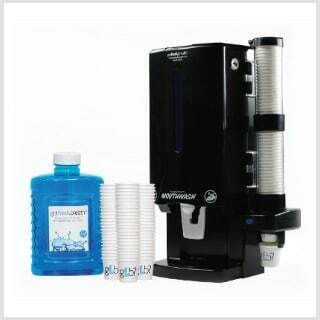 Having tamper-proof mouthwash dispensers located at convenient spots around your workplace can give you and everyone in the office a sense of confidence that, no matter what you all just ate, you can wash it away and make a great first impression all day long! Loyal Hygiene provides sturdy, high-quality, tamper-proof mouthwash dispensers for the workplace, and we refill them regularly so you never need to worry about running out before the big meeting. Just contact Loyal Hygiene today at 703.361.7888 and enjoy all the benefits of fresh breath for everyone at your workplace.